A team of 35 Gurkha Engineers from the Queen’s Gurkha Engineers working under the command of 24 Commando Regiment were deployed to the Caribbean to provide immediate assistance with the humanitarian aid and disaster relief efforts in response to Hurricane Irma as part of Operation Ruman. 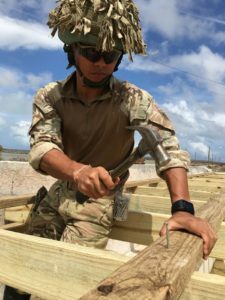 Many islanders have lost their homes, their possessions and their livelihoods due to the Hurricanes and the islanders across the region needed the help of the British Forces to make safe building, supply food and drinking water and get the area back on its feet. The Gurkha Engineers assisted with various programmes on the ground before returning to the UK late last week. Initially deployed providing Basic Combat Engineering and Artisan capability. On deployment, our troops landed in Barbados then flew to Turks and Caicos, British Territory by C130 to assist local public including support to two schools in restoring their basic life support.